ReStaR is the acronym of a research project entitled “Review and improvement of testing Standards for Refractory products”. The project was supported by funding from the Research for the benefit of SMEs Theme of the Capacity Programme, under the 7th Research Framework Programme of the European Union. ReStaR started on 1st October 2013 and has run for 24 months. The project was coordinated by the European Centre for Refractories (ECREF) and involved 13 partners from 7 countries. Refractories are materials essential for all highly industrialised processes which are performed at elevated temperatures e. g. iron- and steelmaking, cement production, glass, ceramics, nonferrous metals, power production and waste incineration. 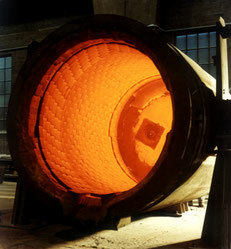 Refractories have high economical importance and serve a key function for the industry in Europe. In Europe, most of refractory manufacturers are SMEs. The technical suitability of refractory products is warranted through physical, chemical and technological materials properties, laid down in data sheets. For the purpose of obtaining those technical specifications, testing methods are described in national and international standardisation systems, like DIN, CEN or ISO. Progressively, the established standard testing methods no longer fulfil the increasing requirements of the refractory market. This project is a response to the need for a systematic investigation of the accuracy, precision and reproducibility of the current EN testing standards for refractories with the aim to enhance their relevance, especially to the specific needs of SMEs. The central objective of this project is to increase the competitiveness of the European SME refractory producers. This will be archived by generating up-to-date EN testing standards as a save guidance for the producers. An extensive investigation of the current EN testing methods, designs of experiments and interlaboratory tests, more specifically collaborative tests, involving the major European refractory testing laboratories will be the key approach to attain this objective. For a successful review of the EN testing standards and an effective dissemination of the results, a strong and broad-based cooperation between transnational partners is planned. For this purpose, the European SME-AG for the refractory industry is involved and brings together the most active European testing laboratories and SMEs to conduct a large scale and in-depth study of EN testing standards.